Don't you just love the bountiful vegetables of summer? I certainly do! Zucchini, yellow squash, tomatoes and onions are stacked and baked ... yes! I made a meal of this while hubby and my boys ate steak and onions I cooked in the crock pot. I went to Walmart the other morning, which isn't much different than most mornings, and took pictures documenting my time there. Taking pictures along the way was so much fun and it didn't bother anyone in the least little bit...they all know us by name. I'll share that in another post. I ended up buying zucchini, Nestle Semi Sweet Mini Chocolate Chips, Hershey's Chocolate Syrup and more Cocoa. This is the result of my shopping trip. Are you thinking a trip is in order, now? My precious oldest son made 6 A's and 2 B's on his final report card for third grade!!!! I wanted to make his something special that was a healthier than my usual way of cooking. 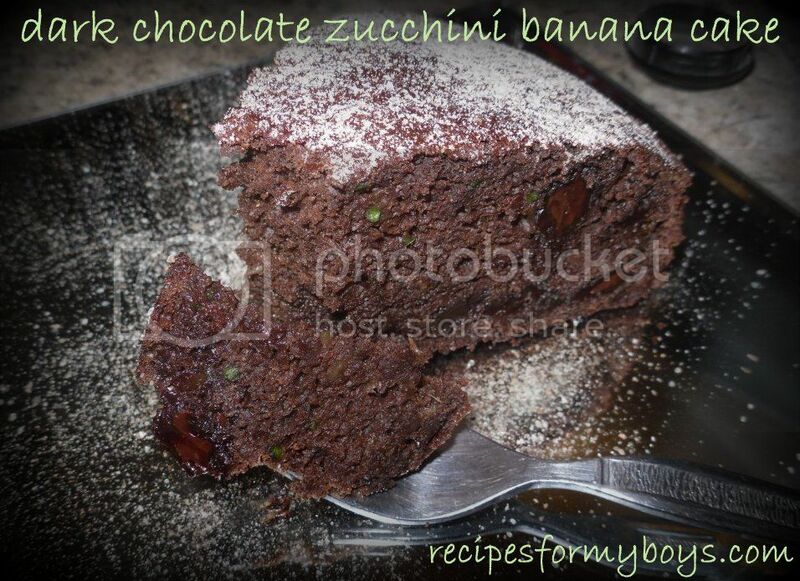 I asked and my gorgeous friend, Ann of Sumptuous Spoonfuls, shared her recipe for Decadent Double Chocolate Zucchini Bread I loved the recipe the moment I saw it. I love ALL of Ann's recipes for that matter! A quick trip to the store for zucchini, braving Tropical Storm Debby's rain bands and a stop by the Dr., I was bitten and scratched by one of our kitties this morning, I was all set to cook. The bread...my boys call it cake, it's that good, has the rich taste a dark chocolate, a hint of banana, not too sweet (you can adjust sugar to your taste), and very moist! A hit! A little dense and oh so good! Well, what are you waiting for? Go pick, or pick up, some zucchini! <3 and hugs! Preheat oven to 350F. Oil or spray 9" spring form or cake pan. Melt chocolate according to directions. Cool. Add cocoa, sugar, eggs and yogurt. Mix well. Add to wet ingredients and mix to incorporate. Pour in pan and bake in preheated oven for 30 minutes. Turn and cook another 10-25 minutes. Yeah, I know it's a wide range in time. I kind of lost track. As always, my oven cooks different than yours. Please adjust time accordingly. It's done when toothpick, skewer or thin knife comes out clean. Cool on rack and wait as long as you can. Okay, go ahead and cut it now. You deserve it! Sprinkle with cinnamon sugar and enjoy! We were out of town all day and came home tired and hungry after being on the road for 5 hours non-stop. We looked in the refrigerator and Reid pulled out leftover rotisserie chicken, eggs, a zucchini and a red pepper. There was our supper ready to be make. Reid did an excellent job of pulling apart the chicken and mixing everything together. Perfect for Sunday brunch or a fast supper. Hope y'all enjoy Reid's Egg and Chicken Pie! <3 and Hugs!